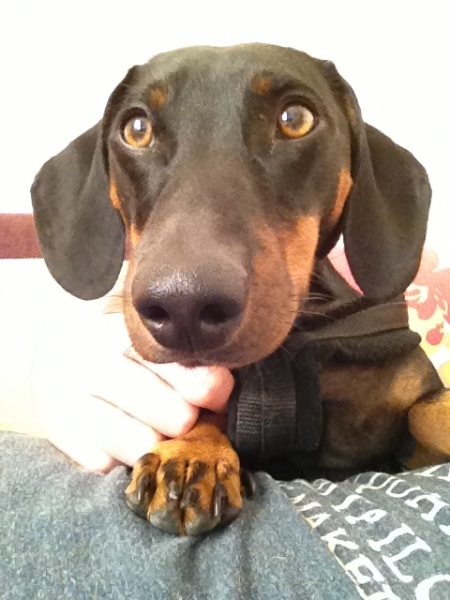 Frankie the one year old dachshund was brought in by owners Kelly and Daniel to see if Noel could do anything to repair a deformity in his front left foot. Frankie is somewhat overindulged and lacking in the good behaviour department, which has led to him eating mobile phones, entire ice lolly sticks, lipsticks and even shoes! 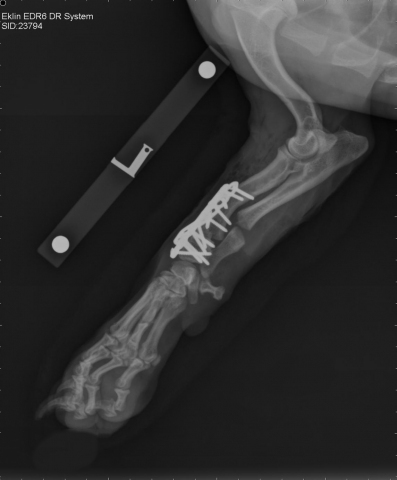 When Frankie visited Fitzpatrick Referrals it appeared that his two front legs were not a matching pair! His left front leg was rotated outwards in comparison to his right leg and naturally it was beginning to cause him pain. 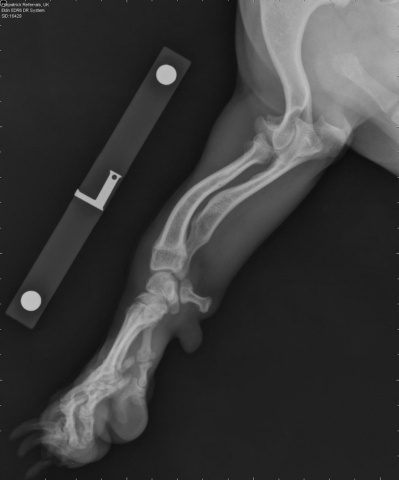 This condition is called an antebrachial growth deformity and it is caused by a disparity in the rate of growth of the two bones which make up the lower portion of the forelimb. 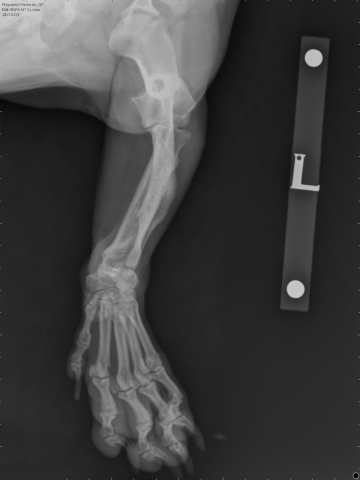 We carried out x-rays and a CT scan to get a clearer idea of Frankie’s problems. The images confirmed what we suspected and that the significant deformity of the left radius was due to the ulna being too short. When surgery was performed on the left leg, a special blade was used to cut the deformed bone – described as an osteotomy. The blade was dome shaped which created a false joint in the bone to allow the limb to be manipulated until it was straight. Once the leg was in the right position, the cut in the bone was held together using special plates and screws to provide strength and stability while the bone healed. Frankie stayed at Fitzpatrick Referrals for a few days to allow us to closely monitor Frankie’s recovery. 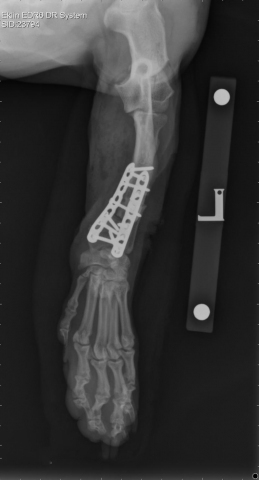 After six weeks the x-rays showed his bone was healing well and without complication. Frankie was gradually introduced to normal exercise and his matching front legs now allow him to get back to his mischievous self.